Déjà vu. Alec Baldwin’s Donald Trump slammed the women accusing him of sexual assault on the Saturday, October 15, episode of Saturday Night Live in a spoof of the volatile second presidential debate. 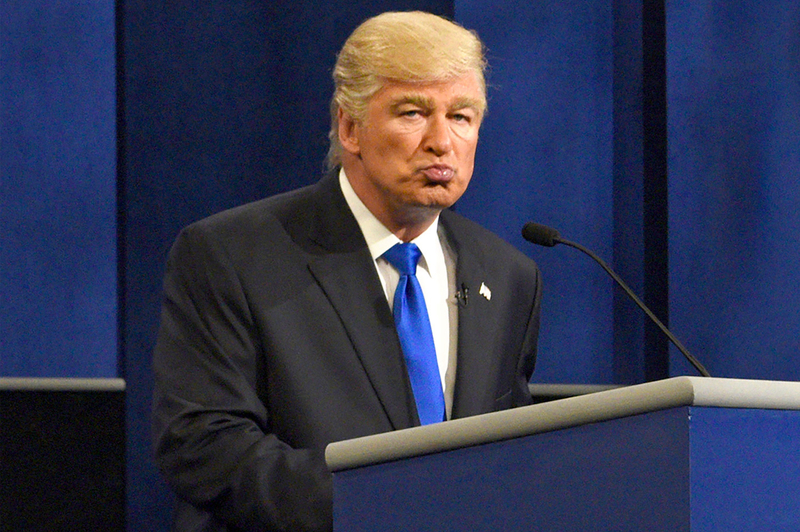 For the night’s cold open, both Baldwin-as-Trump and Kate McKinnon–as–Hillary Clinton walked out on stage with swagger, taunting one another and faking each other out with a faux handshake not unlike the icy greeting the two real presidential candidates exchanged on Sunday, October 9. From there on, the skit unfolded with remarkable resemblance to the actual debate, down to the deadpan questions from audience members and from moderators Anderson Cooper (new cast member Alex Moffat) and Martha Raddatz (Cecily Strong). When faux Trump pointed out that faux Clinton was trying to silence her husband’s accusers, Strong-as-Raddatz asked what he thought of the women who were accusing him of sexual assault. “They need to shut the hell up,” he responded.